Earlier this week we shared the first images of the Samsung Galaxy Sport, Samsung's follow up to the Galaxy Watch and Gear Sport. Original rumours suggested the Galaxy Sport would come in four colourways: black, steel, rose gold and teal. On Monday we saw the brushed stainless steel version for the first time, now, thanks to the latest leak, we can see the other variants. TigerMobiles has shared an "official render" (which you can see above) highlighting the three new colour variants. 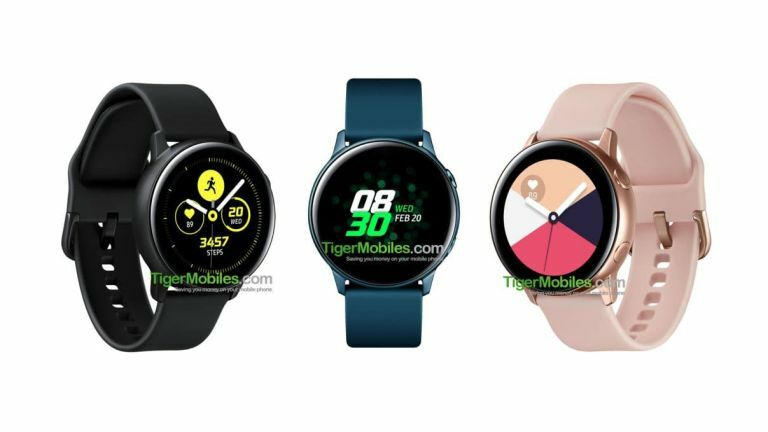 The device is under development with the codename 'Pulse', leading many to believe Samsung is working on the successor the Gear Sport fitness-smartwatch which was released in 2017. We're not yet sure if the new smartwatch will be called the Galaxy Sport, or Galaxy Active, as some rumours have suggested. The key aspect to these new designs is the removal of Samsung's rotating bezel, which has been a much-celebrated feature on previous devices. It allowed users to scroll through the operating system without covering the screen with their finger. It has been suggested Samsung will replace the physical bezel with a touchscreen version and haptic feedback. Any other specific features are light on the ground, although it's thought that the smartwatch will feature an enhanced version of Bixby, 4GB of storage, Wi-Fi, Bluetooth, and mobile payments. Whatever features Samsung has planned we won't have long to wait until find out, as we're expecting the smartwatch to be announced at Samsung Unpacked on February 20th, alongside the Samsung S10.